Francisco Gonzalez is the host of the Agents of Innovation podcast, where he interviews entrepreneurs, philanthropists, and artists. Through his work, personal philanthropy, volunteer activities, and social involvement with live and independent music, Francisco constantly finds himself in the mix of creative entrepreneurs, thoughtful philanthropists, and vibrant musicians and other artists. In 2015, he began the Agents of Innovation podcast to bring the inspiring stories of these individuals and groups to more people. Born and raised in South Florida, Francisco graduated from St. Thomas Aquinas High School in Fort Lauderdale, earned his B.A. in history at Florida Atlantic University, and an M.A. in History at the University of Maryland. Francisco is the Director of Philanthropy at National Review Institute, a “journalistic think tank” that supports the talent and complements the mission of National Review magazine and preserves the legacy of their founder, William F. Buckley, Jr.
Francisco has also served as the Vice President of Advancement for The James Madison Institute (JMI), a think tank headquartered in Tallahassee, Florida. From 2008-2017, Francisco directed JMI’s fundraising and development outreach. Between 2004-2007, Francisco worked for the Intercollegiate Studies Institute (ISI), in roles of Director of Membership and Campus Outreach, as well as a development officer. ISI is an organization devoted to “Educating for Liberty” on America’s college campuses. Francisco currently serves on the board of trustees for AMIkids Orlando and the Central Florida Board of Advisors for The Children’s Movement of Florida. 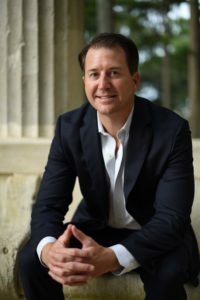 He has previously served on the Board of Directors of Rock by the Sea, a Florida-based charity that organizes music festivals and events to help kids with cancer and other deserving nonprofits. Francisco was also previously Chairman of the board of Project Veritas, an investigative journalism organization led by his good friend, James O’Keefe. Francisco is a featured writer in the Orlando Sentinel Central Florida 100 Voices each Sunday. In his leisure time, Francisco enjoys playing tennis, watching college football and Major League Soccer, reading, running, working out, and hitting the beach. Francisco is an avid traveler. To date, he has visited 47 U.S. States and 19 countries. However, he currently resides in the happiest place on earth, Orlando, Florida.